Soil moisture sensors and other irrigation management tools should be installed in representative locations and maintained to provide the information necessary for making good irrigation-management decisions. Rain gauges are necessary measurement tools to track how much rain has fallen at a specific site on the golf course. On some courses, more than one station may be necessary to get a complete measure of rainfall or evaporation loss. The use of soil moisture probes, computer models, and tensiometers, as well as visual inspections for symptoms such as wilting turf, may supplement these measurements. Computerized displays are available to help visualize the system. Predictive models based on weather station data and soil types are also available. These are relatively accurate and applicable, especially as long-term predictors of annual turf water requirements. Weather data such as rainfall, air and soil temperature, relative humidity, and wind speed are incorporated into certain model formulas, and soil moisture content is estimated. Models, however, are only as effective as the amount of data collected and the number of assumptions made. It is best to have an on-site weather station to daily access weather information and ET rates to determine site-specific water needs. Irrigation controllers/timers should be reset as often as practically possible to account for plant growth requirements and local climatic conditions. Properly calibrated flow meters, soil moisture sensors, rain shut-off devices, and/or other automated methods should be used to manage irrigation. Irrigation rates should not exceed the maximum ability of the soil to absorb and hold the water applied at any one time. Irrigation should not occur on a calendar-based schedule, but should be based on ET rates and soil moisture replacement. 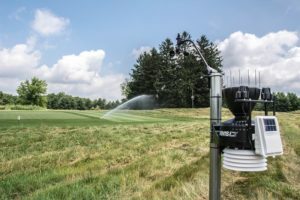 Computerized control systems should be installed on all new course irrigation systems to help ensure efficient irrigation application. These allow for timing adjustments at every head. Rain shut-off devices and rain gauges should be placed in open areas to prevent erroneous readings. Use multiple soil moisture sensors/meters for accuracy and to reflect soil moisture levels. On-site weather stations access weather information and ET rates to determine site-specific water needs. Photo credit: Mark Jones.